Master Queen Cabin + VIP Queen + 2 Twin Cabins that can convert to Kings and each has a foldaway Pullman. All have private bathroom. Personal bathrooms and separate showers in each cabin. Yacht offers rendez-vous diving only. 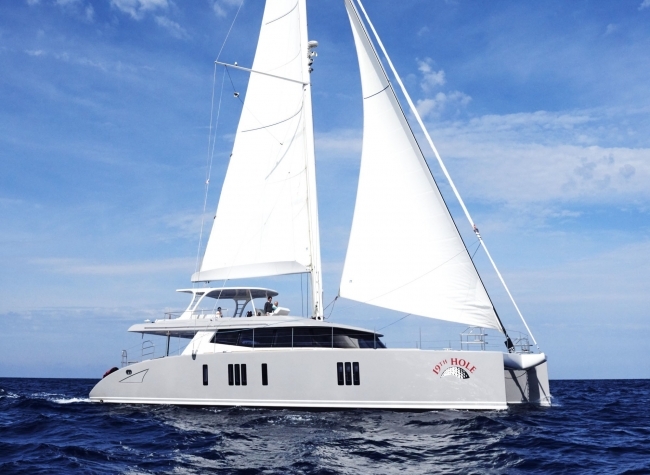 This 74′ modern Sunreef catamaran has Master and VIP cabins, each with Queen berths, plus two additional guest staterooms, each with Twin berths that convert to Queens and each also has an upper, completely-offset, Pullman berth. All staterooms have private bathrooms and beds that face windows looking out to sea. Do you fit? Each cabin also offers streamed movies, zoned music, overhead hatches with blinds, and LED night and day lighting, plus monogramed sheets, Bose speakers, and lots of AC. 19th HOLE’s crew offers laundry service, using the yacht’s washer, dryer, and iron. Built in 2015, the deck saloon is a modern compartment in black leather with turquoise and light blue spots of color. It opens aft to a spacious, well-equipped cockpit with stairs to a fly bridge. Trampolines forward offer lots of sunbathing space. The all-Italian crew of four is headed up by professional yacht captain Michaela Sciarretta, who is assisted by a professional chef and nutritionist Marianne, who in turn are helped by a first mate Daniele and hostess Anna. All have a good command of English. With two Seabobs, four kayaks, and two stand up paddle boards, all 8 in the party can paddle out together to see what’s just beyond the point. The vessel is available in the BVI during the winter months (and they will accept charters down island also) and in the West Med (Italy) during Summer 2017.